The 2015 Irish Open and European Open have just taken place at the Ivy Rooms in Carlow, Ireland. Congratulations to Peter Gilchrist for winning the Irish Open and to Mike Russell for taking the honours in the European Open. Reigning champion Peter Gilchrist defeated 16 times World Champion Mike Russell in the final of the Irish Open, with Mike turning the tables on Peter in the semi final of the European Open, before going on to defeat Phil Mumford in the final. High breaks were the order of the day in both events, with Peter taking the high break in the Irish Open with a 644, a break which only came to an end when he declared a push shot on himself. Highest break in the European Open went to Dave Causier with 747, and Mike Russell also contributed a 697 in the final. Best local performance was by current Irish Champion Wayne Doyle who reached the quarter final of both events, slotting in a couple of century breaks in the process. The Plate Flyer final was an all Irish affair, with ex-main tour professional snooker player Rodney Goggins defeating Liam O’Brien, Rodney also making a break of 101 in the quarter final. See here for report on the RIBSA website. Click here for several recordings. Finalists Phil Mumford and Mike Russell pictured with WPBSA Chairman Jason Ferguson, World Billiards Chairman Alan Chamberlain, final referee Tom Hughes and Tournament Controller Jim Leacy prior to the European Open final. Our thanks to Jim Leacy for acting as Tournament Controller for both events and to Jim and Marian for hosting us at the fabulous Ivy Rooms. 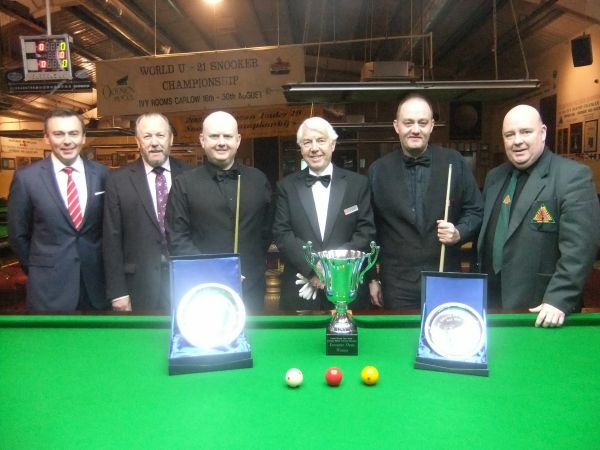 We are grateful to the Republic of Ireland Billiards & Snooker Association for their support and for sourcing all the officials who did a fantastic job for 5 days ensuring that these events ran smoothly. Good luck to those players who are now travelling on from Ireland to Winnipeg, Canada to play the Vimy Ridge Classic & Americas’ Cup which will start on Saturday 23rd May.